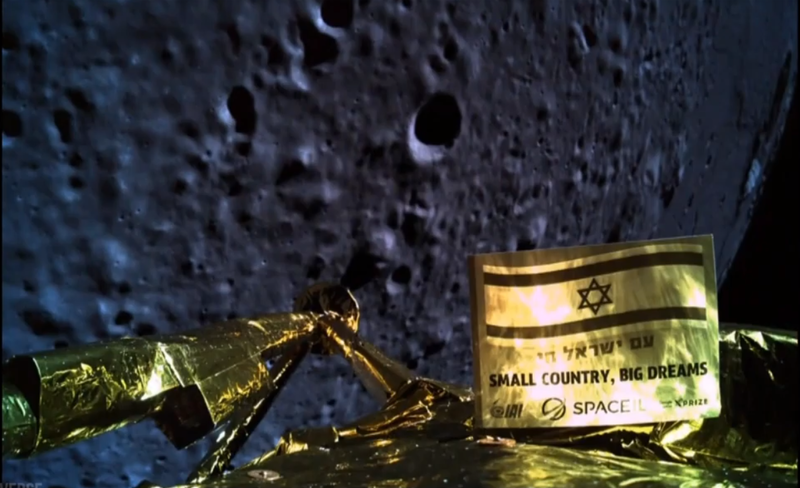 Tonight was a Dayenu moment for Israel - "if we had come so close to the moon but not landed, it would have been enough for us." Enough for the world's tiniest pinprick of a state, just 70 years in existence and stretched to the limit of its resources just to live out each week surrounded by mortal enemies. 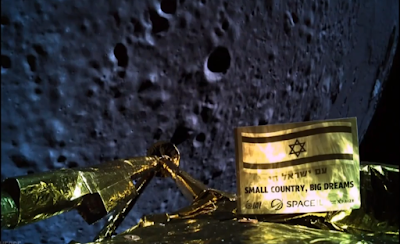 What a stunning achievement to get within meters of a lunar landing. We wouldn't be surprised if at this moment they were giving out candies in Ramallah just as they did with the death of shuttle astronaut Ilan Ramon. Alas, this is what our brothers and sisters have to live with. But whether it's a World Cup qualifier, or Eurovision, or this moonshot - these are precious moments when the whole country huddles together in bars and town squares holding their breath in anticipation of a moment of national triumph. One big family, rooting for its own. The sight of that white-bearded Charedi in the control room was really special. So many of them and their womenfolk serve in ways you don't hear about. When you wake up in the middle of the night in your Israeli hotel room and worry about being in the cross-hairs of Iran and our other enemies and wonder who is watching the skies, it's as likely as not that the girl watching the satellite feed is wearing a sheitel. We are one big family with one unique history of 5,000 years. And our best years are still ahead. Am Yisrael Chai - Lanetzach ! 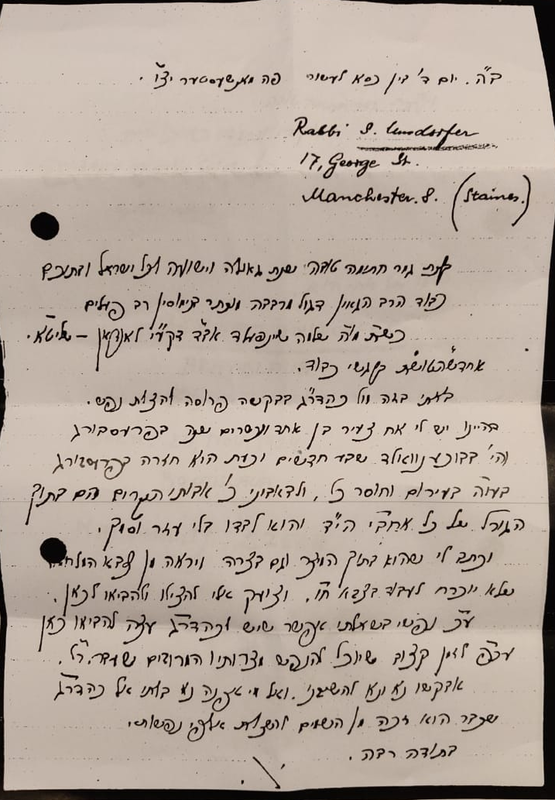 Someone has just sent me this 74 year-old letter to Rabbi Dr Solomon Schonfeld, of blessed memory, appealing for his help to bring my father to England after the war. My late father was one of 3 brothers born in Pressburg (Bratislava) in what used to be Czechoslovakia. Two of his brothers Julius and Shmuel had escaped to England before the war. 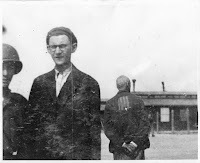 My father Simcha was the youngest, and was rounded up with his parents by the Nazis and sent to Auschwitz. His mother and father were murdered on arrival. 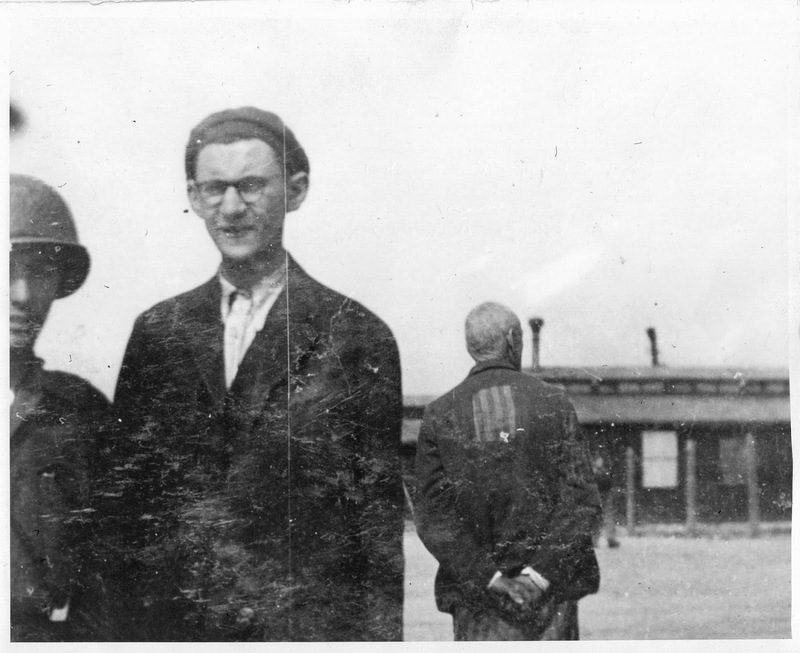 My father survived and returned to his home town of Pressburg with nothing and no-one. In this letter Shmuel appeals to Rabbi Schonfeld for help in bringing his 21 year-old sibling to safety in England. 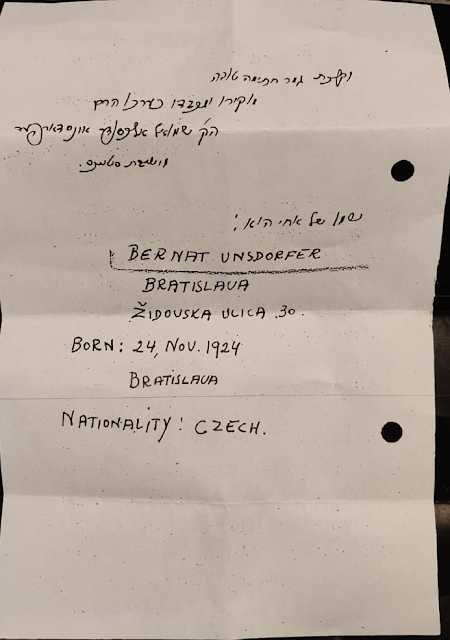 I wanted to record this online as a testament to Dr Schonfeld's outstanding work in rescuing many thousands of our people from Nazi tyranny and to the kindness of the British people and government at that time in providing sanctuary and a new life to so many like my father. It’s been many years since we last met and you were doing such great work as Minister of Education, undoing the damage wrought by your Labour predecessor, Yuli Tamir in restoring the true Jewish narrative to school texts and curricula. I congratulate you on your triumphant return to politics with such an impressive rank in the Likud primaries. And on a personal level, I am delighted to see a new Shomer Shabbat in the high ranks of our party. One of the heroes of the American Revolution coined what became a famous line: “Now is the time for all good men to come to the aid of the party”. This open letter is appealing to you to do just that. 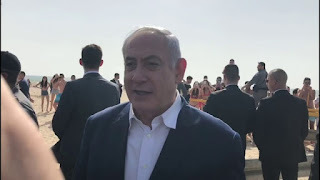 We all know about the unpleasantness between Bibi and you over that rumoured chicanery over the president’s possible choices for next coalition leader. I’m not taking sides on that; the rights and wrongs of that affair are hardly important now, less than 5 weeks from the most crucial Israeli election in recent times. What is now vital is unity within Likud. There is no question that Bibi has been seriously wounded by the ill-timed and partisan indictment announcement last week. Many will be whispering that this is a ‘Caesar and Brutus’ moment within the high ranks of Likud. Such thoughts must be stopped in their tracks or they will destroy Likud and deliver Eretz Yisrael into the hands of the Left. It is obvious that Bibi will soon wish to retire and it is equally clear that you are a strong frontrunner to succeed him as leader. I ask you to burnish those credentials and make a clear and open demonstration of true party leadership. 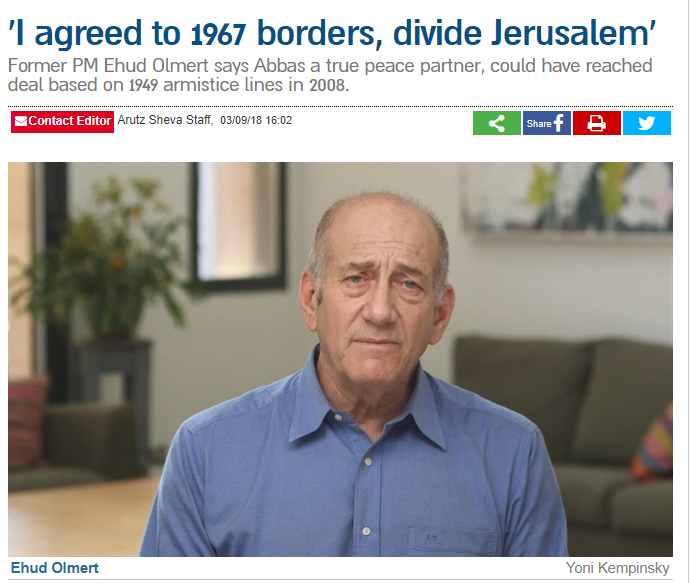 Announce to the media that you stand 100% with Bibi as prime minister and leader of the Likud. Condemn, in the loudest terms, the disgraceful timing of the indictment and the unfair trial of a prime minister by the media and the incessant leakers. Uphold the supremacy of a man’s right to defend himself and the entitlement to a presumption of innocence before due process and trial. In this way you will show yourself truly worthy of future leadership and gain enormous support from the grassroots of Likud members who are overwhelmingly sympathetic to Bibi. Become their new champion in defending their man. A bad day for Bibi? 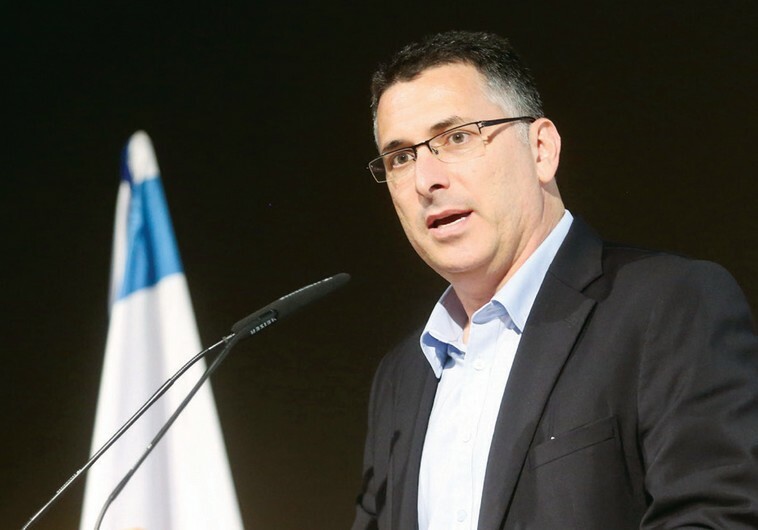 A bad day for the Likud? But let’s understand what is going on here. It’s no coincidence that Bibi opened with thanks to President Trump for his support. This is because they are kindred spirits. They are both targets of the same new and powerful enemy: the weaponised state. For Trump it started under Obama when the IRS was weaponised to harass any right wing campaign funds and NGOs, the FBI was weaponised to eavesdrop on Fox News and ultimately the justice department was weaponised to investigate supposed fake Trump-Russia election collusion as a smokescreen to the genuine Clinton collusion when Hillary’s State Department approved the transfer of 20% of America’s uranium holdings to Russia, while nine investors in the deal funnelled $145 million to the Clinton Foundation. Whilst the Mueller probe against Trump has found no Russia collusion, it’s clear that Trump associates – such as Cohen and Manafort – have been threatened with long jail terms for unrelated misdeeds unless they dish up some Trump dirt, whether real or made-up. The same goes for Bibi. Just like Trump, he has a 90% leftist media ranged against him along with the powers that be in the self-appointed court system and ‘Deep State’ of the civil service. This is the ugliness of our post-democracy age. If you can’t win power through the ballot box, use all other means. Weaponize the media, justice and law enforcement, make sensational allegations and leak stories all over the place. Trial by television. As I posted last week, the Lahav 433 police unit has an abysmal track record with high profile indictments which have an even bigger failure rate than Britain’s SFO (which satirical magazine Private Eye lampoons as: the Serious Farce Office). When the Bibi cases collapse in two years’ time, it will be too late to fix next month’s electoral damage to the Right which the media, supreme court, left-wing parties and their Arab bedfellows are hoping for. 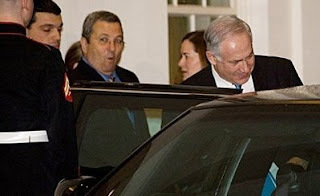 But let’s not forget, this is Bibi Netanyahu. This is a man who doesn’t shy away from a fight. A man who defied the last president of the United States by going over his head to Congress over the Iran deal. If he fights his corner even 1/10th of the extent to which he has fought Israel’s corner all these years, he will come out victorious. When it comes to predicting Israeli voting intentions, I always think of what the average taxi driver would be saying. I think the Israeli cabbies are smart enough to see through this leftist smokescreen and will reflect the wider public in rejecting the slander and voting in favour of what’s been achieved by Likud under Netanyahu. The most sustained period of peace and quiet, economic strength and success and levels of optimism and happiness that we have seen in the history of the state. 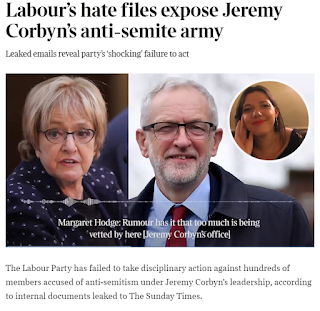 You report (19 February) that a number of implacably anti-Corbyn MPs have left the Labour party alleging a failed “approach to dealing with antisemitism”, with Luciana Berger criticising Labour for becoming “sickeningly institutionally racist”. We urge all who wish to see an end to bigotry and racism, and who seek a more just society, to give their support to the Labour party. By all the brouhaha that’s blown up over the far-right Otzma Yehudit party, you’d have thought Bibi had invited them to join the Likud. AIPAC’s condemnation came as no surprise as they need to appeal to a broad American Jewish audience many of whom are Leftists whose faith-du-jour is political correctness and whose self-esteem is measured in likes and followers on social media. Thus anyone remotely connected with Meir Kahane is as toxic as ISIS. But even as this issue erupted, Leftists were willing to give a pass to ISIS and allow their brides and expat fighters to return to America and Britain because they deserved a chance at rehabilitation. But for followers of Kahane it seems there is zero tolerance. No, Bibi did not invite Otzma to join the Likud. He simply brokered a deal to allow Otzma votes to actually mean something in this election, rather than fall into the dustbin by failing to reach the qualifying threshold. The message is: if the Left can have a Hanin Zoabi, the Right is entitled to have the people of Otzma. The difference between Left and Right is often associated with politics. But its pathology is much more fundamental. Leftists like to see the world as a cuddly fluffy place where everyone should be given the chance to get along. They have no concept of pure evil and will almost always seek root causes to explain evil acts rather than accept them as evil on face value. People on the Right accept that evil acts are committed or incited by evil people and if we haven’t already eliminated them, they can never be trusted anywhere near the things we hold dear. Put simply, the fundamental difference between Left and Right is between fantasists and realists. Yuppies in the Tel Aviv bubble will likely vote for Gantz and Lapid simply because they’re the ‘new thing’ and it’s cool to get aboard. That’s the zeitgeist that got geniuses like Trudeau and Macron elected. The older Haaretz-readers in the bubble mostly believe that if we give the Arabs their state they’ll leave us alone. If it has to include the settlements and most of Jerusalem, so be it. At least they won’t want Tel Aviv. This is the same fantasy that holds that if you throw enough meat at an attacking lion it will turn into a vegetarian. Which brings me back to Kahane. Granted, I don’t condone everything he did or said in his lifetime. But the one thing you cannot deny is that he was a visionary. He never stopped warning that there would never be peace with the Arabs. In the 30 years since his murder by an Arab assassin, there have been more than a dozen peace plans bandied about. Grand ideas of land swaps, tunnels between Ramallah and Gaza and of course Oslo which repackaged the PLO as a more user-friendly “PA” led by people in suits. Those plans either failed or caused more bloodshed than before. Kahane understood that this was never a territorial dispute. It was about our very existence as Jews … and within ANY borders. 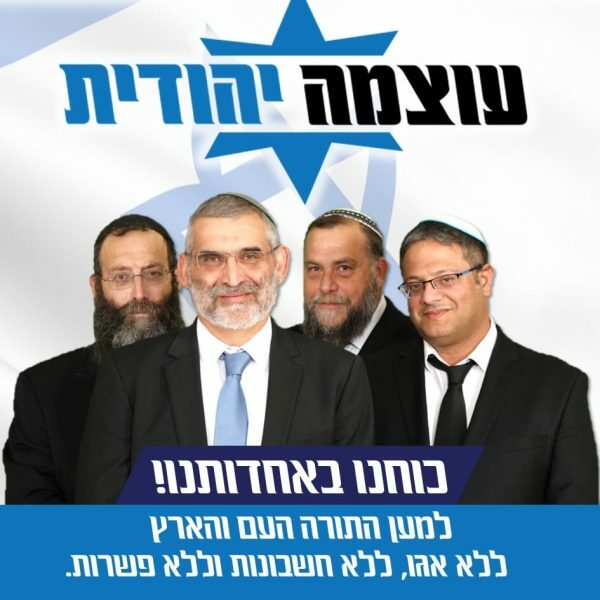 The people who will be voting for Otzma Yehudit are not necessarily Jewish terrorists. Instead they are Jewish realists. And unlike members of AIPAC, they are not watching this scenario from their armchairs in Long Island. They are surrounded on three sides by the mortal enemies of Israel, armed by Oslo and empowered by Leftists who see poor Palestinians as underdogs under brutal occupation, rather than the pure evil that unrepentantly butchered poor Ori Ansbacher two weeks ago. The same evil that Kahane warned us about 30 years ago. And to this resident evil, Lapid and Gantz want to give a state? 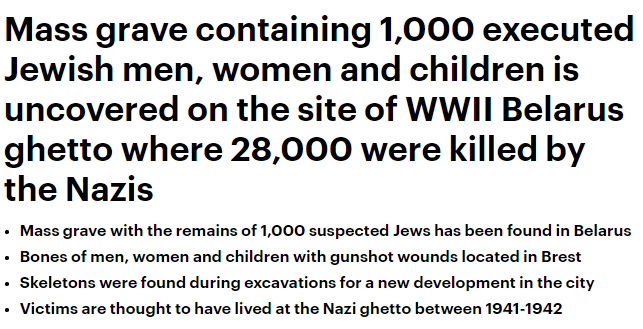 The only way of preventing this madness is by making as many right-wing votes count to preserve Eretz Yisrael as there will be left-wing ballots in favour of more peace experiments or, worse still, votes that allow the unified Arab parties to hold the balance of power over our territory. I end with a commandment from this very day’s Torah reading: “Beware lest you forge a covenant with the inhabitants of the land to which you come, lest it become a pitfall for you”. This news is heartbreaking for all our people. The thought of these tragic souls never being at rest for nearly 80 years, that their horrifying deaths went unnoticed and without meaning or purpose. Well, today - more than any other time in those last 80 years - these souls have a real meaning and purpose. It is to forcefully rebut the current generation of Holocaust deniers and belittlers. 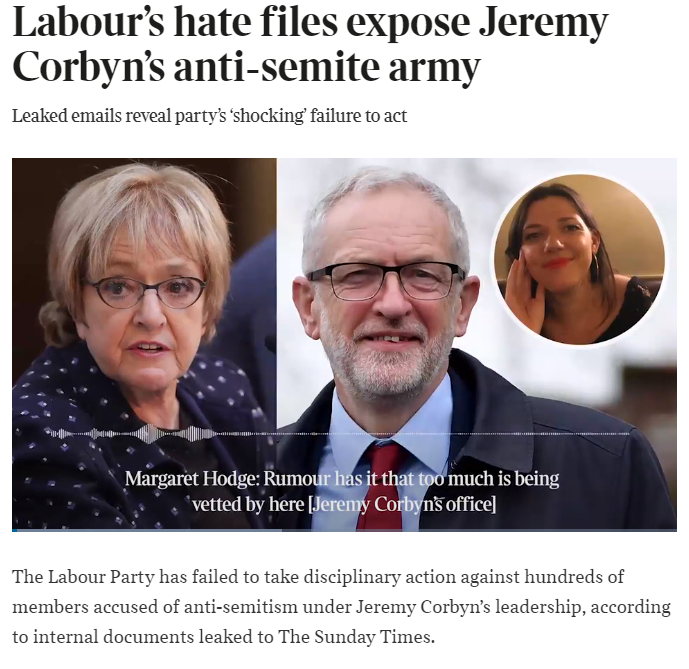 It is to shame the new wave of anti-Semites that peddle the only form of racism that seems to have a free pass in these days of insane political correctness. 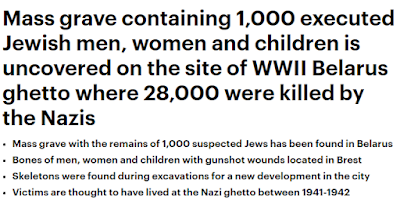 The survivors may now be disappearing fast, but the sanguinary soil of Europe will yet yield up more of its macabre evidence to damn the naysayers, just as the soil of our beloved Israel gives up evidence of our 3,000 year history and inalienable rights to the homeland. 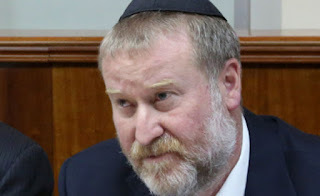 I’ve never had much respect for the Israeli justice system, particularly the Supreme Court headed by self-appointing elites who regard themselves as an upper chamber of the Knesset legislating from the bench rather than interpreting the laws passed by the people’s will. Happily this cartel of elites is now being taken down and the justice system reformed by the intrepid justice minister Ayelet Shaked, now of Bennet’s New Right party. But the current attorney general is one of the good guys. He’s what one would regard an ‘erlicher yid’ (honourable Jew) as distinct from other Haredim in government who have disgraced their ethical upbringing. Which is why I am so puzzled by his intention not to defer announcement of Netanyahu indictments until after the April elections. At least this is what is reported by the incessant leakers in his own justice department. What is the urgency Avichai? Is Bibi a flight risk? Will those cigars disappear from his humidor? Is that German submarine at risk of sinking before Election Day? Is Yediot Achronoth losing readers because of the delay? 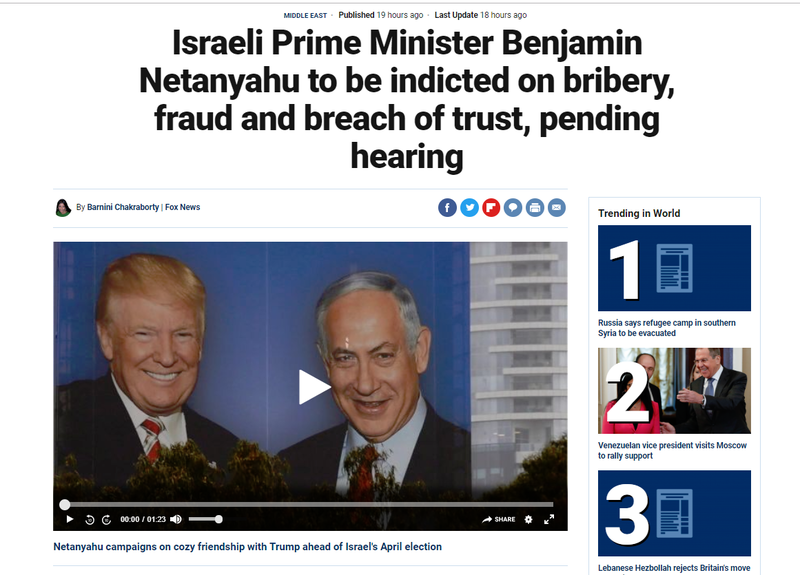 More importantly: did Bibi call an election just to delay indictments? Everyone knows that it was Liberman’s walkout that precipitated the election. 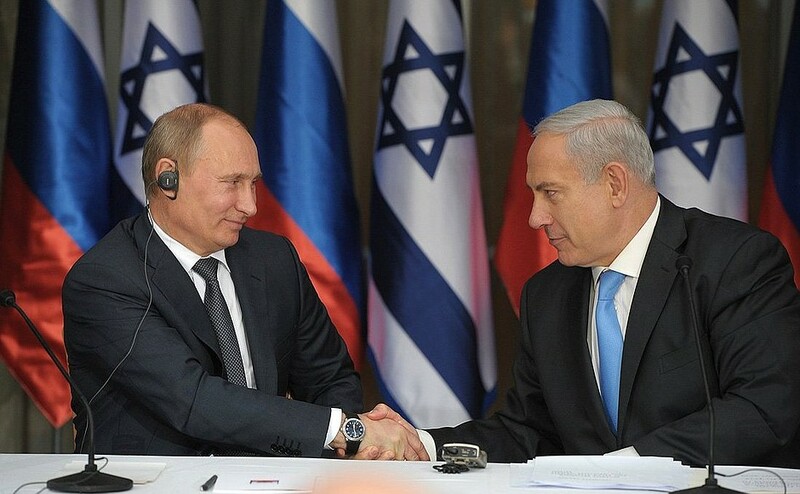 Did Bibi make him do it? Can anyone make that big boy do anything he doesn’t want to? And what’s clearest of all - other than the utter shallowness of the charges - is Bibi’s absolute determination to face and challenge his accusers in court. So Mr Attorney General Avichai Mandelblit …. what’s your hurry? On any objective view, given the total absence of any time prejudice, a decision to announce an indictment weeks before a general election can only amount to one thing. A blatant interference in that election and an attempt to pervert the course of the democratic process. This would be the case in any democratic country. How much more so in Israel where so many political indictments spawned by the now infamous Lahav 433 police unit have ultimately failed in court. So Avichai. Do the right thing. Defy the Left-wing pressure, discredit the leakers. Make your own decision. The right decision. The one that’s faithful to the people of Israel and the democratic process.